"MX missile" redirects here. For the early USAAF missile equipment designation system, see MX missiles. The LGM-118 Peacekeeper, also known as the MX missile (for Missile-eXperimental), was a land-based ICBM deployed by the United States starting in 1986. The Peacekeeper was a MIRV missile that could carry up to 10 re-entry vehicles, each armed with a 300-kiloton W87 warhead in a Mk.21 reentry vehicle (RV). A total of 50 missiles were deployed starting in 1986, after a long and contentious development program that traced its roots into the 1960s. MX was designed to allow the US to ride out a sneak attack by the Soviet ICBM fleet and then launch a counterattack. 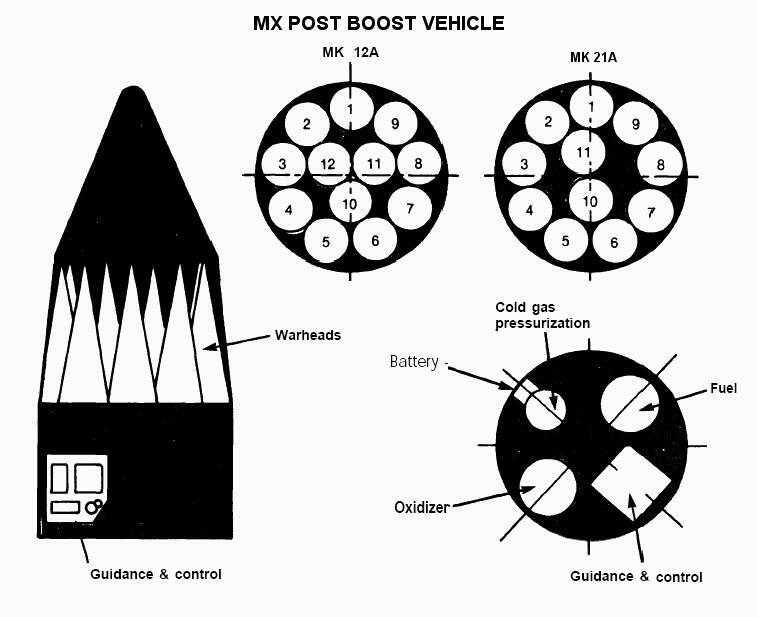 In order for the counterattack to be effective, MX had to have three qualities: the ability to be rapidly re-targeted, so that it would attack only those Soviet missiles known to be in their silos; enough accuracy to allow a small warhead to kill an enemy silo, so that more warheads could be packed on a single MX missile; and a basing system that meant enough of the missiles would survive an attack that the counterattack would be effective. Among these three, the basing issue remained an unsolved problem and the subject of much criticism during the MX's development. After considerable debate, President Ronald Reagan announced that the newly named Peacekeeper would be put into service in existing LGM-30 Minuteman silos, a temporary solution until a final basing solution was decided. During the same period, the United States and the Soviet Union were involved in negotiations on the START II treaty, under which ICBMs were allowed to carry only a single warhead each. Because the Minuteman could carry a single warhead for far less money, and the Peacekeeper was proving highly unreliable in the field, the United States agreed to remove the Peacekeeper from their nuclear force in this treaty. Although START II was not ratified by the United States, the missiles were removed, with the last one going out of service on 19 September 2005. Their advanced W87 warheads were moved to Minuteman III. The private launch firm Orbital Sciences Corporation has developed the Minotaur IV, a four-stage civilian expendable launch system using old Peacekeeper components. ✪ Does a Trident D5 fit in a Minuteman III silo? Mk21 re-entry vehicles on a Peacekeeper MIRV bus. Each carries a 300-kT W87 warhead with about 20 times the power of the bomb dropped on Hiroshima during World War II. Deployment of the Minuteman ICBM began in 1962, during the Cold War, and proceeded rapidly. Limited accuracy with a circular error probable (CEP) of about 0.6 to 0.8 nautical miles and a small warhead of less than 1 megaton meant the system was unable to attack hardened targets like missile silos. This limited these early models to attacks on strategic targets like cities and ports, and the system had little or no capability as a counterforce weapon. The Air Force relied on its manned bombers as the primary weapon for attacking hardened targets and saw the ICBM as a survivable deterrent that would guard against an attack on its bomber fleet. As the Kennedy administration took power, the new Secretary of Defense, Robert McNamara, was given the seemingly impossible task of making the US military the most powerful in the world while at the same time reducing its expenditures. He ultimately solved this problem by greatly reducing reliance on the bomber and passing the role to the Minuteman. Over time, improvements to the Soviet missiles, real or imagined, led to US officials proposing a worrying scenario; a Soviet first strike with a limited number of warheads aimed at the Minuteman control bunkers could cripple the US ICBM fleet. At the time a limited attack was all the Soviet could mount; their missiles had limited accuracy so only the small number of their missiles carrying very large warheads (multi-megaton range) could be used. They had just enough of these to make a damaging, but not critical, attack on the US fleet. By April 1964 the US had more ICBMs on active alert than strategic bombers, which exacerbated this concern. The US ICBM fleet was primarily targeted against cities, and retargeting them took considerable time. In the event of a Soviet missile launch, the US faced the difficult decision of whether to fire their own missiles immediately or wait to determine the targets of the Soviet missiles. Firing early might mean striking civilian targets (countervalue) when the Soviets had only targeted military installations, something US politicians considered to be a serious problem (part of the flexible response doctrine). Conversely, waiting to fire might mean the loss of the ICBM fleet. However, as the US Navy was quick to point out, their Polaris fleet's stealth and mobility would maintain a countervalue force. This scenario was of deep concern to the Air Force. If the role of the nuclear missile was to ride out a first strike and ensure a counterstrike, then the Navy might be handed the mission outright. Looking for a new role, the Air Force began to turn their attention away from the deterrent role towards counterforce. Continued work on the Minuteman led to the Minuteman II specification, set in 1962. The new version included two key improvements. One was the new NS-17 inertial navigation system, which improved the CEP to 0.34 nautical miles, enough to allow it to attack hardened targets. Just as important, the guidance system allowed for the inclusion of eight pre-selected targets. This allowed the force to ride out a Soviet first strike, select the appropriate enemy targets, military or civilian, and launch. Against a limited attack, it offered the US a major strategic advantage. Of course, the Soviets could also improve their own system's CEP and turn all of their missiles into counterforce weapons as well. With the ICBM force now critical to the strategic mission, the Air Force became increasingly interested in new ways to keep the missiles safe from such an attack. The Air Force had depended on engineering support from TRW during the early days of the development of their ICBM force. In 1960 a number of TRW and other engineers involved in the ICBM program formed The Aerospace Corporation, initially working on the Mercury spacecraft, X-20 Dynasoar and various ICBM projects. In 1964, the Air Force contracted them to consider a wide variety of survivable ICBM solutions, under the name "Golden Arrow". The project considered road, rail, submarine and air-launched weapons. One of these suggested an air-launched ballistic missile. The proposal called for an enormous (for the day) turboprop-powered aircraft with two-day endurance carrying up to eight missiles that would be dropped out the back, parachuted to the vertical, and then launched. As part of the same study, Aerospace also considered a missile and wheeled launcher combination that was small enough that they could be carried in existing C-141 Starlifter aircraft. During periods of heightened tensions, they would be flown to practically any airport and set up. The Soviets would have to target thousands of airports, runways and even dirt strips and long stretches of highway in order to attack the fleet. Finally, they also considered conventional missiles in "super hard" silos, buried under the southern side of mountains. As the enemy warheads would approach at a fairly shallow angle from the north, they would strike the north side of the mountains before they could hit the silos themselves. Properly positioned, this would keep the explosions at least 5,000 feet away from the silos; it was believed that silos able to withstand multi-megaton explosions at one mile could be built, although this was an area of some uncertainty. This system had the advantage that the basing would be immune to changes in accuracy or speed of the attack, only enormous increases in yield could overcome this physical barrier. They proposed 100 missiles in three bases of thirty missiles each. They expected that at least one base would be able to survive even an all-out attack. However, if such a force of approximately 30 missiles was going to be a reasonable deterrent, each missile would need to carry 20 or more warheads. To launch them, the study introduced the "ICBM-X", a massive new 156 inches (400 cm) diameter design, well over twice the diameter of the existing LGM-30 Minuteman, and larger even than the Titan II "heavy" design at 120 inches (300 cm). Any of the Golden Arrow concepts would be extremely expensive, and in the era of Robert McNamara's US Department of Defense, cost was as important as any other consideration. As Alain Enthoven put it, "Our gross national product, though large, is limited. If we attempted to develop and procure a dozen or more distinct different nuclear delivery systems… we doubtless would end up squandering our resources and not doing a good job on any of them." Golden Arrow, along with many similar proposals from other firms, proceeded no further, in favor of the Minuteman II. Another project spun out from the ICBM-X was a smaller version limited to 10 to 20 warheads, known initially as WS-120A and later as BGM-75 AICBM. The missile was small enough to fit in existing large silos, like those for the Titan II, but was otherwise similar in concept to the ICBM-X, with a circular error probable (CEP) of about 0.1 miles, and especially the ability to be quickly re-programmed to attack any targets needed. In comparison, the Minuteman II had a selection of eight targets, any one of which could be quickly selected for attack, but otherwise selecting a target outside this pre-computed list was not something that could be done "on the fly". WS-120A's preferred basing mode was a super hardened shelter, but dispersed mobile options were also considered. However, like Golden Arrow before it, WS-120A's advantages found themselves being diluted by the new Minuteman III. The Minuteman III used the new NS-20 inertial navigation system (INS) with a CEP of 0.12 nautical miles, and three warheads with an expanded collection of radar countermeasures. Although the system did not include the ability to be rapidly retargeted, this capability was under development and started deployment in 1972, before the planned 1975 introduction date of WS-120A. When it was fully deployed in 1978, the entire ICBM fleet could be entirely reprogrammed in 10 hours. Since the late 1950s, engineers at the Charles Stark Draper Laboratory had been working on a new type of inertial platform that replaced the mechanical gimbals with a sphere floating in a thin layer of fluorocarbon fluid. The so-called "flimbal" (apparently for "FLoated Measurement BAL") would offer unprecedented accuracy and would be free from "gimbal lock", a problem that caused conventional platforms to "tumble" and lose their accuracy. Like the ICBM-X, there was little development as there appeared to be no need for a platform with the sort of accuracy the flimbal provided, and the expense of developing the system would be extremely high. In spite of a lack of official interest, during the late 1960s Kenneth Fertig managed to arrange some funding through the Air Force for the "SABRE" INS project, short for "Self-Aligning Boost and RE-entry". The name referred to the concept that the system would be so accurate and free from the effects of mechanical shocks and jarring that it would not require any other form of "fixing" in flight. This was in contrast to the stellar-inertial systems under development by the Navy and others. It would retain its accuracy even through the rough conditions during re-entry, allowing the creation of maneuvering reentry vehicles. During the late 1970s, the Soviet Union fielded a large number of increasingly accurate MIRVed Heavy ICBMs like the SS-18. These missiles carried as many as 10 warheads along with up to 40 penetration aids, meaning that a small number of launches could present a threat to the Air Force's ICBM fleet while retaining a large force in reserve. If the Soviet Union launched a first strike and the US did not respond immediately, the majority of their missiles and strategic bombers might be caught on the ground. A credible deterrent force would remain, but such a force might not have enough warheads left to attack both the remaining Soviet fleet and cities and other military targets. In such a situation, the US would be left with two uncomfortable options. If they chose to respond in kind and attack the remaining Soviet missile fleet, there would be little to respond with if the Soviets immediately launched against US cities. The other option would require the US to be the first country to launch an attack on civilian targets, an attack that was both morally reprehensible as well as against stated policy. This worrying scenario led to the effort to develop a new ICBM with the accuracy needed to be an excellent counterforce weapon, the survivability needed to absorb a Soviet first strike, and the MIRV capabilities needed to ensure even a small number of survivors would be able to attack the remaining Soviet missile fleet. The Minuteman III simply did not have this combination of features. Whether or not this problem actually existed is open to debate. The Minuteman had a relatively fast launch time, and early warning satellites meant that commanders would have almost instant warning of a Soviet launch, with ample time to plan a response. However, it would not be until much later in the sequence of events that land-based radars would be able to track the incoming individual warheads and determine the targets. In the case of a limited counterforce attack, it would be desirable to wait until the individual targeted silos were determined, determine which Soviet missiles had not been launched, and then launch only the targeted missiles against their unlaunched Soviet counterparts. This would require extremely tight timing. The development of practical SLBM systems upset the nuclear equation dramatically. These weapons were essentially invulnerable when at sea, and offered a credible countervalue force (against civilian targets) although early models like the UGM-27 Polaris and UGM-73 Poseidon did not have the accuracy to attack Soviet silos and thus offered little counterforce capability. In some ways this helped the Air Force, as it meant they could concentrate on the counterforce scenarios, knowing that a countervalue attack would always be available from the Navy. However, improvements in SLBM accuracy might allow them to handle counterforce as well, and render the entire land-based ICBM fleet superfluous. The Air Force was not interested in handing the strategic role to the Navy. A survivable ICBM would address this issue. The outcome of this thinking was obvious from the start; in 1971 the Air Force started a requirements development process combining the ICBM-X and SABRE concepts into a single platform, "Missile, Experimental", or MX. The new missile would be so accurate and carry so many warheads that even a few survivors would be able to destroy enormous numbers of any remaining Soviet force. The specifications for MX were fixed in February 1972, and the advanced development program started in late 1973. At the time, MX was to be based in existing Minuteman silos, in keeping with the original ICBM-X concept of MX as essentially a bigger Minuteman. The larger size of the missile being stationed in a tighter silo, not initially designed for it, resulted in the missile-body notably including graphite lubrication blocks being fixed to the midsection of the missile, as seen in pictures and being jettisoned in videos of the missile launching. For MX, the Draper Laboratory developed SABRE into the "Advanced Inertial Reference Sphere" (AIRS). AIRS would have a drift rate of only 1.5 x 10−5 degrees per hour, allowing it to be periodically referenced to an external point, like the silo wall, and then left for extended periods of time. Over the period of the flight the drift would be so low that any inaccuracies in the platform would account for a maximum of 1% of the warhead's final accuracy–the rest would be due to issues like the timing of the firing of the rocket engines, minor differences in warhead construction, and unavoidable randomness in the atmosphere. The Air Force also contracted with Autonetics for a backup design using mechanical gimbals, the "Advanced Stable Platform" (ASP). In May 1975 the first hand-built AIRS was transferred from Draper's laboratory to Northrop for further development. Time exposure shot of testing of the Peacekeeper re-entry vehicles at the Kwajalein Atoll, all eight fired from one missile. In 1976, Congress refused to fund MX using a silo-based system on grounds of vulnerability, and the project was halted. Several new proposals were made for alternate basing arrangements, including mobile basing in railway cars that would be sent out into the nation's rail network during times of heightened threat levels, and more complex systems of deeply buried silos under mesas that would include systems to quickly dig themselves out after an attack. Eventually, the program was reinstated in 1979 by President Carter, who authorized deployment of 200 missiles throughout eastern Nevada and western Utah. The deployment would occur in a system of multiple protective shelters linked by underground or aboveground roads, the so-called "Racetrack" proposal. However, local opposition in Nevada was intense, and the concept gained a powerful enemy in the form of Senator Paul Laxalt. Initially support was high in Utah, especially in the Beaver County area; although opposition increased dramatically following a statement of disapproval by the leaders of The Church of Jesus Christ of Latter-day Saints. When Ronald Reagan took office, Laxalt's close ties with Reagan proved useful. Reagan canceled the new shelter system in 1981, calling it "a Rube Goldberg scheme". He proposed deploying an initial force of missiles in the approximately 60 existing Titan II silos, removing those now outdated missiles from service. The silos would be modified for much greater strength, and a number of Minuteman III silos similarly adapted over time to bring the force to a total of 100 missiles. Additionally, he suggested funding development of three additional concepts, airborne drops from cargo aircraft, an "active defense" using short-range anti-ballistic missile, or basing new silos deep underground or on the south side of mesas ("reverse-inclination basing"). The latter two quickly proved unacceptable for various reasons, while testing of the air-drop concept was pursued. On 22 November 1982 the administration announced that the missile was to be known as Peacekeeper, and introduced an entirely new basing concept, the "dense pack". The dense pack idea involved building super-hardened silos that would withstand more than 10,000 psi (70 MPa) of overpressure, compared to 2,000 of the existing silos, or 5,000 psi for the upgraded versions originally proposed. This extra hardness can be easily offset by minor increases in warhead accuracy. The key to dense pack concept was to space the silos so close together, about 1,800 feet (550 m), that warheads attacking one silo would destroy others incoming to attack another silo in the same pack. This "fratricide theory" was highly criticized due to the expected relative ease with which the Soviets could modify their warheads and circumvent this design. All that was required was that several warheads arrive and be detonated within a few milliseconds of each other, so the blast waves did not reach each other before completing destruction of the silo. Such timing could be easily achieved with commercially available clocks. Congress again rejected the system. Retired Peacekeeper Rail Garrison Car prototype at the USAF National Museum. The Peacekeeper Rail Garrison is a mobile missile system that was developed by the United States Air Force during the 1980s as part of a plan to place fifty MGM-118A Peacekeeper intercontinental ballistic missiles on the rail network of the United States. The railcars were intended, in case of increased threat of nuclear war, to be deployed onto the nation's rail network to avoid being destroyed by a first strike counterforce attack by the Soviet Union. However the plan was cancelled as part of defense cutbacks following the end of the Cold War, and the Peacekeeper missiles were installed in silo launchers as LGM-118s instead. By this time both the US and USSR were beginning to field third-generation SLBMs with greatly improved accuracy. These now arguably had all of the capability of the land-based ICBMs, and were equally able to carry out the counterforce mission. [citation needed] Additionally, the submarines could manoeuvre much closer to their targets, greatly reducing the warning time, potentially to the point that the command structure would not have time to launch their ICBMs and bombers before the warheads were reaching them. This scenario was a major concern during the early 1980s, to the point where it was the topic of lengthy television programs. This development caused some[who?] to suggest that the solution was to simply shift the entire deterrent force to the SLBM on both sides. In both the US and Russia, however, a combination of factors led to the continued retention of the nuclear triad. A compromise was eventually developed in mid-1983. Under this scheme, 100 missiles would be deployed in existing Minuteman silos to "show national will". The plan also called for the removal of the old and accident-prone liquid fueled Titan II from use. However, this did not address the problem the MX was originally intended to solve, providing high survivability. This would later be addressed through the re-introduction of the "rail garrison" concept, with twenty-five trains each carrying two missiles. This system was expected to be operational in 1992. The supposed counterforce gap, then being widely talked about on television, also resulted in the schedule for silo deployment being moved up, dropping the production time from 44 months to 29. Additionally, the plan also called for the development of an entirely new missile, which would emerge as the MGM-134 Midgetman. The Midgetman deliberately carried only one warhead and was highly mobile. Countering a single Midgetman would require the Soviets to blanket an area around its last known position with warheads. Even if this was successful, they would destroy only a single warhead. Faced with this choice, it was expected the Soviets would instead expend their warheads on easier targets. The new ICBM was originally planned to be called "Peacemaker", but at the last minute was officially designated the LGM-118A Peacekeeper. It was first test fired on 17 June 1983, by the Air Force Systems Command Ballistic Missile Office (Norton AFB, CA), 6595th Missile Test Group (Vandenberg AFB, CA Strategic Air Command), and Martin Marietta, from Vandenberg AFB, California Test Pad-01, traveling 4,200 nautical miles (4,800 mi; 7,800 km) to strike successfully in the Kwajalein Test Range in the Pacific. The first eight test flights were launched from an above ground canister on TP-01, with the remaining test and operational Strategic Air Command flights from silos (LF-02, −05, & -08) all located on North Vandenberg AFB. [citation needed] A total of 50 flight tests were accomplished. The operational missile was first manufactured in February 1984 and was deployed in December 1986 to the Strategic Air Command, 90th Strategic Missile Wing at the Francis E. Warren Air Force Base in Cheyenne, Wyoming in re-fitted Minuteman silos. However, the AIRS was not yet ready and the missiles were deployed with non-operational guidance units. AIRS had 19,000 parts and some of these required as many as 11,000 testing steps. Bogged down in paperwork due to government procurement policies, managers started bypassing official channels and buying replacement parts wherever they could be found, including claims that some of the parts were sourced at Radio Shack. In other cases, managers had created false shell companies to order needed test equipment. When these allegations were released by 60 Minutes and the Los Angeles Times, the fallout was immediate. Northrop was slapped with a $130 million fine for late delivery, and when they reacted against employees they were countersued in whistleblower suits. The Air Force also admitted that 11 of the 29 missiles deployed were not operational. A Congressional report stated that "Northrop was behind schedule before it even started" and noted that the Air Force knew as early as 1985 that there were "serious system deficiencies as well as a lack of effective progress". They complained that the Air Force should have come clean and simply pushed back the deployment date, but instead, in order to foster the illusion of progress, the missiles were deployed in a non-operational state. The first prototype AIRS, by then known more generically as the Inertial Measurement Unit, or IMU, was delivered in May 1986, 203 days late. It was not until July 1987 that the first production AIRS were ready to ship, and the complete supply for the first 50 missiles was not complete until December 1988. Given these delays, and increased performance of the UGM-133 Trident II, Congress had already cancelled the 100-missile option in July 1985. In that decision, Congress limited the deployment of Peacekeeper ICBMs to 50 missiles until a more "survivable" basing plan could be developed. Development of the rail garrison system was carried out in parallel. However, budgetary constraints and the dissolution of the Soviet Union led to its being scrapped. The National Museum of the United States Air Force has a rail garrison box car on display on the museum grounds east of the main display hangars and developmental remnants of the program can still be found at Vandenberg Air Force Base. The project had already cost around $20 billion up to 1998 and produced 114 missiles, at $400 million for each operational missile. The "flyaway" cost of each warhead was estimated at 20 to 70 million dollars. The missiles were gradually retired, with 17 withdrawn during 2003, leaving 29 missiles on alert at the beginning of 2004, and only 10 by the beginning of 2005. The last Peacekeeper was removed from alert on 19 September 2005 during the final deactivation ceremony when the 400th Missile Squadron was inactivated as well. During the ceremony an Under-Secretary of the Air Force credited the Peacekeeper with helping to end the Cold War. The Peacekeeper rockets are being converted to the satellite launcher role by Orbital Sciences, as the Minotaur IV (OSP-2), while their warheads will be deployed on the existing Minuteman III missiles. Parts of the missile 'Roll Control System' (RoCS) were reused during the Ares I-X test for the Ares V program. The United States Air Force was the only operator of the Peacekeeper. Airborne Missileers operating the Common Airborne Launch Control System onboard Airborne Launch Control Center aircraft provided a survivable capability to remotely control and launch the Peacekeeper ICBM in the event the underground Launch Control Centers were unable to do so. Orbital Sciences: Will use the Minotaur IV civilian launch platform version. ^ Malik, John (September 1985). "The Yields of the Hiroshima and Nagasaki Nuclear Explosions" (PDF). Los Alamos National Laboratory. Archived from the original (PDF) on 14 May 2006. Retrieved 5 September 2007. ^ MacKenzie 1993, p. 205. ^ a b MacKenzie 1993, p. 206. ^ Pomeroy 2006, p. 123. ^ MacKenzie 1993, p. 213. ^ a b Pomeroy 2006, p. 124. ^ Pomeroy 2006, pp. 124–129. ^ Pomeroy 2006, p. 131. ^ Pomeroy 2006, p. 133. ^ a b Pomeroy 2006, p. 135. ^ Pomeroy 2006, p. 136. ^ Pomeroy 2006, p. 137. ^ Pomeroy 2006, p. 143. ^ Pomeroy 2006, p. 140. ^ MacKenzie 1993, p. 218. ^ MacKenzie 1993, p. 222. ^ MacKenzie 1993, pp. 225–226. ^ MacKenzie 1993, p. 226. ^ MacKenzie 1993, p. 229. ^ Martha Sonntag Bradley. "The MX Missile Project". Utah History To Go. State of Utah. Retrieved 9 June 2012. ^ Jolley, Joann (1981). "News of the Church: First Presidency Statement on Basing of MX Missile". Ensign. The Church of Jesus Christ of Latter-day Saints (June 1981). Retrieved 9 June 2012. ^ a b c d e Cushman 1988. ^ "United States Retires MX Missile | Arms Control Association". www.armscontrol.org. Retrieved 28 August 2016. "The Politics of Armageddon: The Scowcroft Commission and the MX Missile," in Kenneth Kitts, Presidential Commissions and National Security (Boulder: Lynne Rienner Publishers, 2006). MacKenzie, Donald (1993). Inventing Accuracy: a historical sociology of nuclear missile guidance. MIT Press. Pomeroy, Steven (11 August 2006). Echos That Never Were: American Mobile Intercontinental Ballistic Missiles, 1956–1983 (PDF). US Air Force. Archived from the original (PDF) on 6 April 2012. Retrieved 23 October 2011. Wikimedia Commons has media related to Peacekeeper missile.